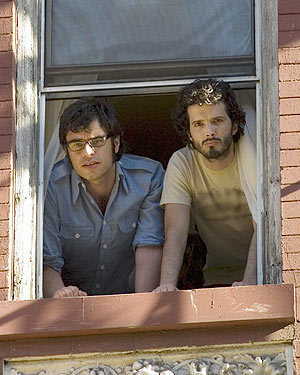 Flight of the Conchords. . Wallpaper and background images in the Flight of the Conchords club tagged: flight of the conchords jemaine bret. This Flight of the Conchords photo contains हस्ताक्षर, पोस्टर, पाठ, चॉकबोर्ड, साइन, and साइन इन करें. There might also be विंडो बॉक्स, transom, transom खिड़की, पंखे रूप का खिड़की, ट्रांसओम, ट्रांसम विंडो, फाइनलाइट, सरदल, transom विंडो, fanlight, झोपड़ी प्रिवी, पृथ्वी कोठरी, jakes, आउटहाउस, प्रिवे, जेक, बाहर वाले घर, and निजी.